I picked this frill hem skirt up on a complete whim a couple of weeks ago because as sad as it sounds I rarely have time to go shopping anymore. I knew I loved the look of it as well as instantly knowing how I wanted to style it but rather than heading for the fitting rooms, I went straight to the tills instead. You can probably imagine my relief and delight that the skirt fit and looked exactly the way I wanted it to. There's something about this skirt that I associate with the tennis which I really quite like and it is after all the start of Tennis season. 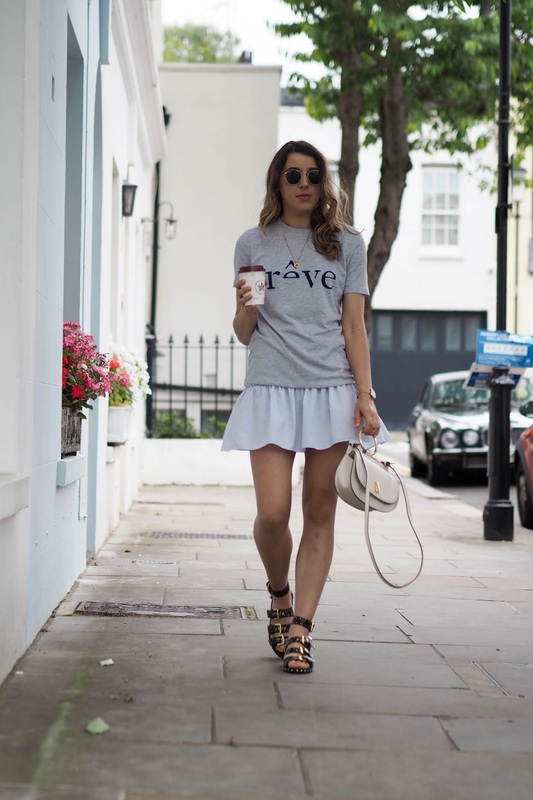 The easiest styling trick I find to dress something down is pairing it with a slogan tee. 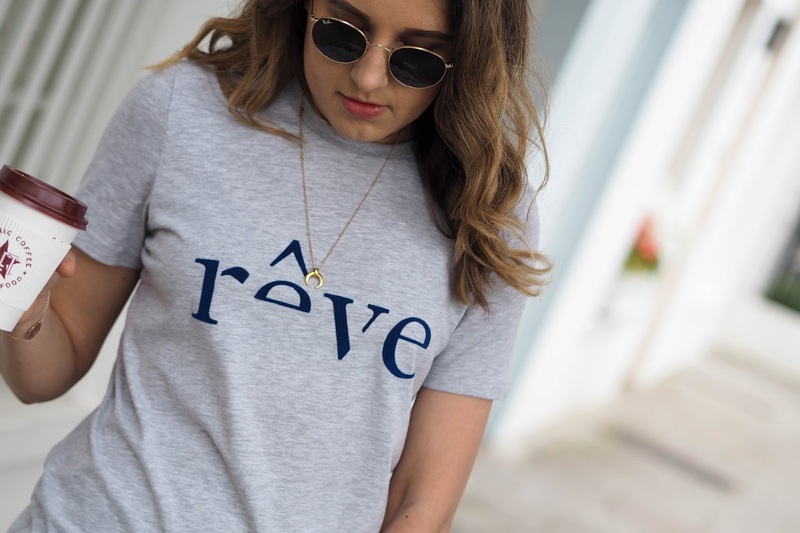 There has been a real emphasis on slogan tees this season with so many choices available on the high street. Some of my favourites have been from the likes of ASOS and Topshop. 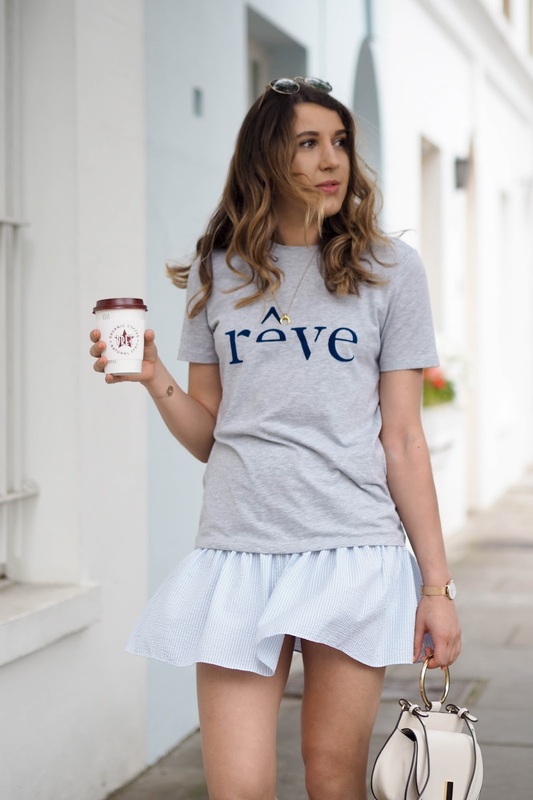 Take this Selected Femme tee for example, it's very in line with the Whistles aesthetic but paired here with this skirt dresses it down in a way as to not make it too casual either. 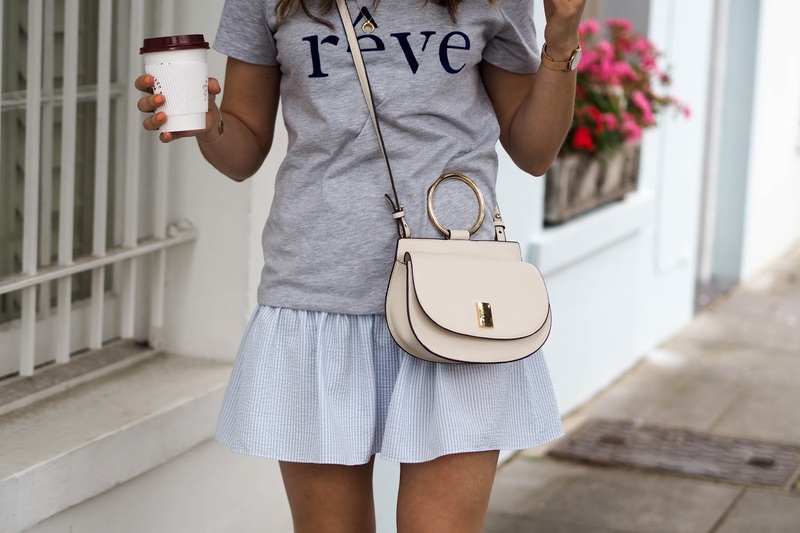 Needless to say I absolutely love it and have also been wearing it with denim cut off shorts and jeans as well as tucking it into my favourite floral print skirts. A great all rounder if you ask me and you can never go wrong with a grey tee. I spoke about my love for these amazing studded sandals in my previous blog post but I really cannot get enough of them right now. I love that they are a bit sturdier than your average sandal and they just add an extra detail to an outfit which I love. You can find outfit details to all the pieces I'm wearing by clicking on the individual images below. What's in her wardrobe is a personal style, fashion and beauty blog written by Gemma Talbot.